Flat Time House presents new work produced by Bea McMahon during a period of time in residence during November and December 2010. McMahon's intention in Cats (HD video, colour, sound) and Mats (wool, whiskers, walnuts) is the collapsing together of two types of time. 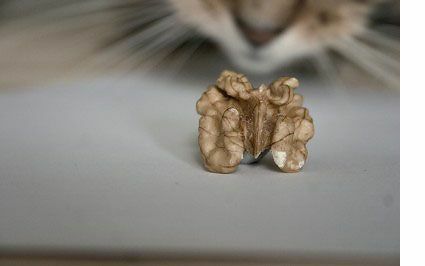 The work is made up of things that are alike to other things: walnuts looking like the brain, for instance, or a mounted stone lion taking the form of a cat on a mat. A fold in time is temporarily created by the collision of things and beliefs that are out of time with each other; they are the myth and meter of two different eras. In medieval music, Complete Time sounded three beats in the whole and was notated by an O. Our contemporary hip-hop soundtrack of four beats in the whole was known as 'incomplete time' - still notated today by an incomplete circle like a letter C or an opening bracket (. The space of musical time metrics has shifted from the medieval ratio based measure to the modern fraction based one. The 3/4 time signature now embodies the role and presence of Complete Time's measure - hiding it within three quarters of its former whole. The two cats in McMahon's film play out these time signatures on wooden boards. The cat with a limp has the meter of 3/4 or Complete Time, the cat without a limp keeps 4/4 or common time. In medieval mythology the absent beat of the limper sounded in another world. The work deals in the meaning of things and the agency of images and signs. In medieval times it was believed that eating walnuts would be good for the brain because of the visual closeness of the two. Then the idea of one thing 'matching' another and resulting in an action to 'make things work' fell out of favour. In place of it the signs and notations of science and mathematics do the same work of transformation. In 2009, almost as a lesson, the eating of the 3D chunky cipher of the walnut was found, by empirical observation, to benefit the brain.